Will the eurozone survive 2012? Europe faces an existential crisis in 2012. Credit market stress in response to ballooning sovereign debt levels has forced governments to announce a series of ill-conceived bailout packages. Policy intervention has become increasingly frequent and elaborate, but has failed to address the underlying causes of the credit market revolt. European energy companies are now confronted by the credible threat of a eurozone breakup. Europe faces an existential crisis in 2012. Credit market stress in response to ballooning sovereign debt levels has forced governments to announce a series of ill-conceived bailout packages. Policy intervention has become increasingly frequent and elaborate, but has failed to address the underlying causes of the credit market revolt. There appears to be a lack of political will to commit to fiscal consolidation, debt restructuring and bank recapitalisation on a scale required to restore market confidence. To brush over this, European leaders have chosen austerity and further leverage as their policy weapons. It is hard to envisage an orderly resolution to the crisis if they continue down this path. In Dec 2011 the European Central Bank (ECB) intervened on a huge scale to provide lending facilities to Europe’s ailing banks over a 3 year horizon, action which may provide temporary relief. But the ECB has no mandate to monetise sovereign debt to the scale of the refinancing requirements illustrated in Chart 1 (eurozone relative to GDP) and Chart 2 (in absolute terms for Europe’s peripheral economies). Since sovereign bonds make up a large part of the capital base of European banks, the fate of sovereigns and banks is closely intertwined. It is important to recognise that a disorderly eurozone break up in 2012 is a long way short of a foregone conclusion. There are policy measures, such as further debt monetisation, that may be used to buy time to restructure debt and recapitalise the banking system. 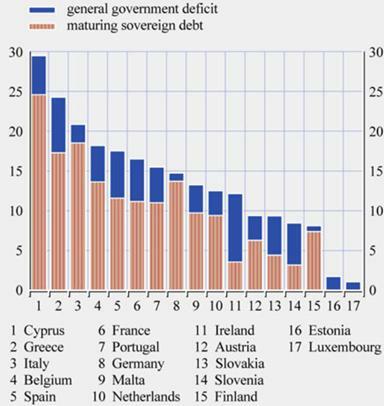 However failure to resolve the debt crisis is causing substantial damage to European economic growth. This is partly through damage to market, business and consumer confidence as a result of uncertainty around the crisis impact and resolution. But it is also via a very tangible tightening in bank lending as Europe faces a renewed credit crunch. The nature of the political response, focusing on the symptoms rather than the cause, means the situation is likely to deteriorate before meaningful steps are taken to resolve the crisis. As a result, a European recession in 2012 appears almost inevitable. Whether or not this is accompanied by a disorderly eurozone breakup would appear to be a question of political will. 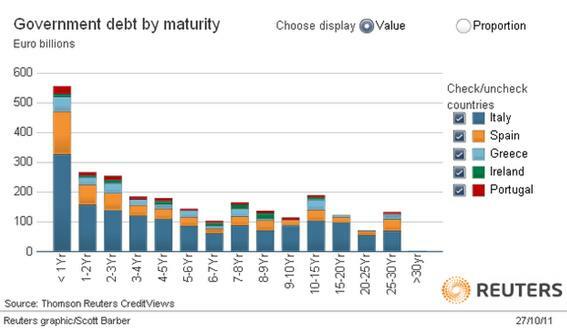 The impact of the debt crisis on European energy markets has grown over the last six months. Commodity prices have softened, access to capital has tightened and investment projects have been cancelled. But the impact of a disorderly breakup of the eurozone is something entirely different. The probability and nature of such an event is very hard to predict, although credit market pricing is flashing a clear warning signal. Prudent risk management is not about predicting the future, but it does involve confronting a credible threat. In our view, the threat that a eurozone breakup poses to most European energy companies warrants careful impact analysis and contingency planning. We look at some prudent risk management steps that energy companies can take to strenghten their business against the impacts of a eurozone breakup in next week’s article.